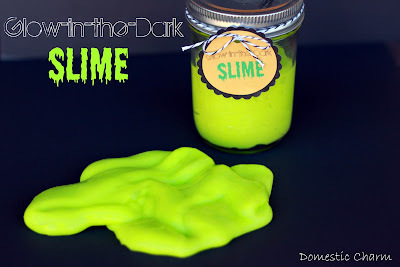 When I came across this glow-in-the-dark slime recipe at about.com I knew I had to make some for Hudson! It is the perfect Halloween craft for boys! It would also be great for kids Halloween party favors or gifts to give to your little one's friends. 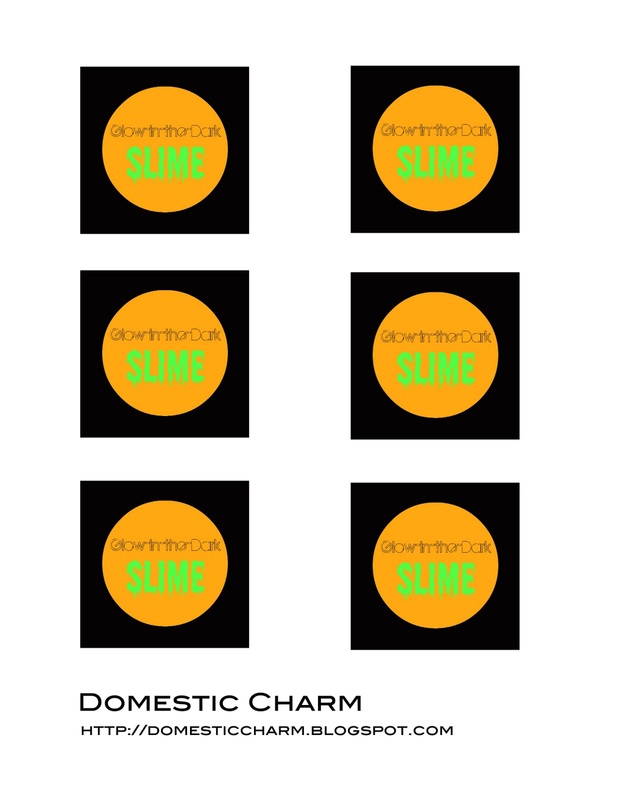 I made some free "Slime" labels to print and use on jars or bags of slime. 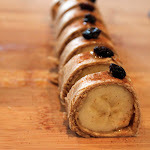 You can find the recipe below along with the free labels! I altered the recipe a bit from the original recipe at about.com, but it came out great! First mix together the Elmer's glue and the 1 cup of warm water. Stir in the paint and food coloring. In a separate small bowl mix together the 1/3 cup warm water and 2 teaspoons of borax. Stir until the borax is dissolved. Now add about 2 tablespoons of the borax solution to the glue solution. You WILL NOT use all of the borax solution. Stir continuously while adding the solution. The more borax solution you add the stiffer the slime will be. So if you want the slim to be more runny, then add less borax solution. 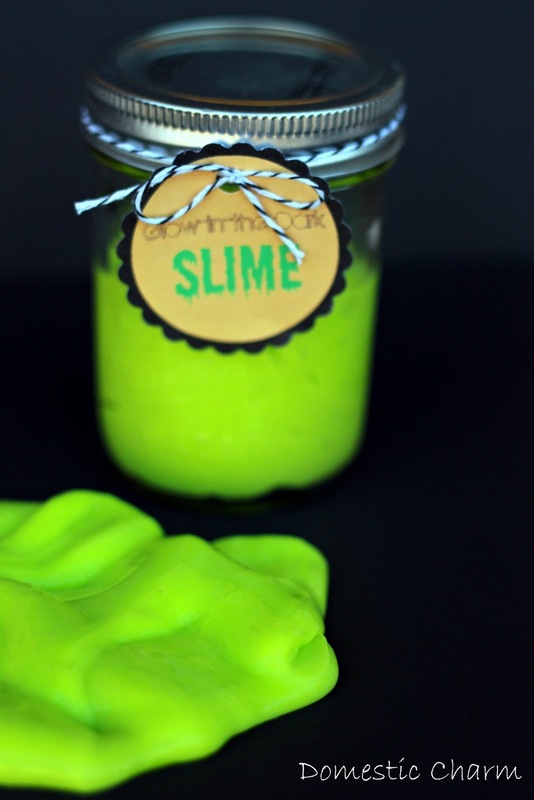 You can add more green food coloring while stirring these solutions together to get your desired color of slime! It should start sticking together and you've got green glow-in-the-dark slime! This recipe can make 2 small half jar fulls of slime or your could package a smaller amount of slime into favor baggies. 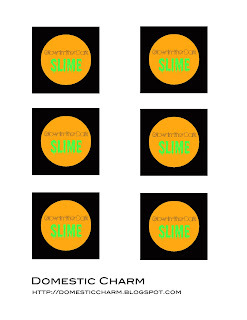 You can find the Slime labels here and tied them on with black bakers twine, which you can fine HERE. TIPS: You can find glow-in-dark-paint at craft stores in the paint isles, and borax can be found at most grocery stores along side the laundry detergents. Also make sure to check the paint that you buy to see that it is safe to use for the project. 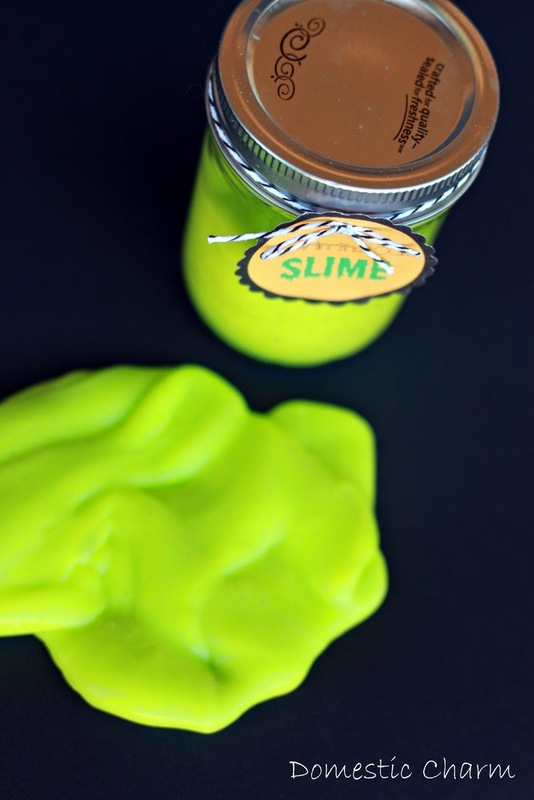 This slime would not be suitable for small children who might put some in their mouth. You can also find products through link provided here. Stopping by from tip junkie! I've got two boys and this seems like something they would love! WOAH! That's sooo crazy cool! My 3 yr old would LOVE that. I'd be thrilled if you'd link up at my kids' fall crafts party! I had no idea you could do this! Hm.. how can I make my daughter grow up faster.. What's that glue like? I.e. what could be used as a general replacement? you can use white glue, but it changes the opaqueness of it, making it a little more like GAK. Still tons of fun though. how long does it glow for? I need help! We made one batch and it turned out great - SO EXCITED! Then our next three batches were too watery and did not "gel" together. Any suggestions? I am not sure what we are doing wrong. Thanks for your help! Hi! I figured this out today-make sure to stir at the same time you add the warm Borax solution. This causes a chemical reaction. If you do not stir while adding the Borax it will NOT stick together. We LOVE this slime!!! hey, great post. the kids are gonna love this as a stocking stuffer. it was easy to follow but i might add that after a while i just went in and mixed with my hands. it came together really quick. oh and the clean up was much snappier than i thought it would be. thanks! Thanks for sharing this recipe! I've made slime before but never glow in the dark! Totally awesome. Made a batch to into the Christmas basket for the family across the street. Again, thanks for sharing! How long does this stuff last in an airtight container? Looks like so much fun! How long the slime will glow for will depend on which glow in the dark paint or product you use. Ours would glow for maybe 5-10 minutes then we had to place it by a light to recharge the glow again. @Anonymous The slime we made lasted for about 2 months on an airtight glass jar. Then is started to get a little soupy. It would help to make sure your glass jar is very clean or even sterilized. does it get all over furniture and stuff? thats my only concern, that it will ruin the carpet or furniture ect. ??? great idea though! i'm excited to try it! @j k greenI made this an activity that my son played with at the table because otherwise I would probably be finding slime all over my house. Sometimes I use a vinyl tablecloth to lay on the floor under his play table in case anything falls on the floor it makes for an easy clean up. Whether it's play dough, slime, sand, ect. I made this with my little girls today. They loved it. We made it pretty stiff. They cut it and made "cookies" out of it. what fun! online and purchased them right away. May have been the best thing I've ever done. It's so heart warming to see their creativity really shine through! Happy New year! can it do anything like bounce or stretch real well? Love it. Wish I knew how to do this when my kids were little. How exciting! I remember slime as a kid. Could keep you entertained for awhile ;) Thanks for sharing, I'll have to try with my little one. 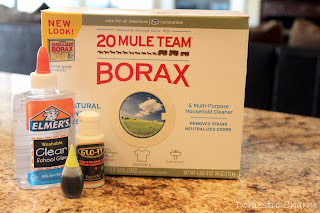 Do you know what i can use instead of Borax? 1 cup corn starch, 1 cup baking soda and then stir in 1/2 cup of water. Could add food coloring too. I haven't tried this one yet...sounds like it may be a bit more sticky and messy. Not sure though. I tried your recipe and while it didn't resemble slime it was fun to play with. I had to add a lot more than 1/2 cup of water to make it pliable. When the two powders mix with the water it becomes what looks to be a liquid mess but if you pull it into a ball and toss it between your hands very fast, it will stay solid. As soon as you let go (or stop moving) it goes to liquid. I made a small batch of this and my 3 year old wasn't interested in it (he's into squishy textures) but I had fun playing with it. It was also very easy to clean up off the floor and rinsed easily from your hands. Would you be able to change up the color? My kids want to put it with their Valentine's & make it red. Lol! I know slime isn't red, but they wanted to be creative. I made this yesterday, and I think the secret is to just keep slowly stirring and give it time. At first I thought it wasn't going to form into a ball and needed another dash of the borax solution, but then all of a sudden it just gelled and became exactly what it was supposed to be. It's perfect slime. But in retrospect, the glow-in-the-dark part isn't really necessary; There's no way he playing with this in the dark, lol. 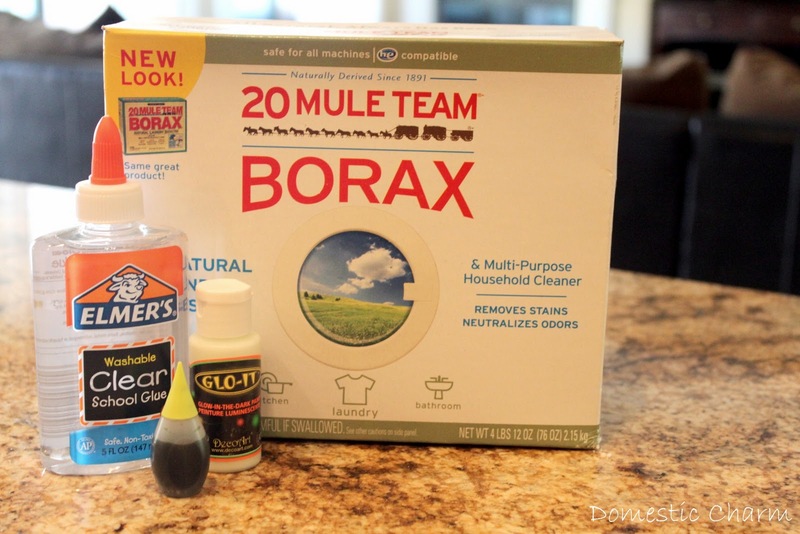 do you know if the borax solution needs to be warm? i'd love to save the extra and use it again? thx! I know one of the purposes of the warm solution is to dissolve the borax. But not sure if it will effect how it turns out. You could always try warming up the solution a bit before making another batch. When your mixing it and handling it, does the foodcoloring dye your hands? We did not have any problem with the food coloring staining out hands. Just make sure to mix the coloring into the slime before handling it. You can add the food coloring while stirring it together. 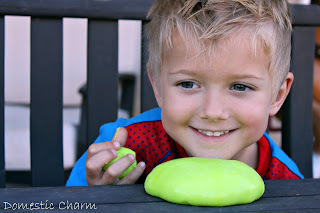 My boys & their friends had a super slimy good time making your glow-in-the-dark slime. Thanks for helping this craft-challenged Mom! 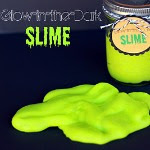 Feel free to stop by & check out our adventure -- http://www.fortuitoushousewife.com/2012/03/glow-in-dark-slime-slimy-good-time.html. Just wondering how long the glow lasts? I'd like to make this as part of goodie bags for my daughters bday but I'd like to make it ahead of time. Does the glow last for quite a while? It will depend on they type of glow in the dark paint that you use. I would check the back of the bottle of whichever paint you choose to use. I wanted to say thank you for posting this! 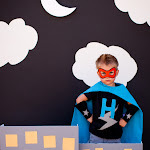 I made these for my son's birthday party and shared with the readers on my blog and directed them to you! The kids loved them! Also, noticed you are in AZ! Love meeting local bloggers, looking forward to reading more of your goodies. How many slime balls does one batch make for like birthday favors? Really depends on the size you'd like to make. Maybe 2-4. I filled 2 small jars halfway with the recipe. I am a kindergarten teacher and would love my students to each make a ball. is there a way to make a smaller batch? I have to purchase the items to make it. I just thought it would be fun for them to actually experience the process themselves. Never mind kids, Im gonna make this for my 24 year old boyfriend!! lol he will LOVE it!!! where do you find CLEaR elmer's glue?? You can find clear glue at a craft store. I found some at Hobby Lobby. where do you get glow in the dark paint? You can find the glow in the dark paint at a craft store. I got mine at Hobby Lobby. 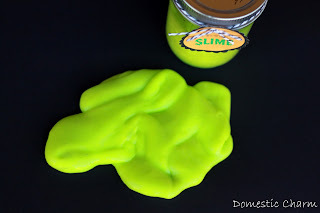 This slime was great! We made orange and pink for my boy and girl. Total time: 15 minutes! They are cutting it up with pizza cutters now...so fun and great. I have also seen a recipe out there for liquid starch and clear glue, however I know that wouldn't be 100% safe if swallowed either. I think this would be best for older kids or fully supervised with younger ones. Worked great! 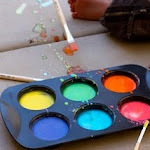 We did this for fun on a playdate and the kids LOVED it! Thank you so much for sharing this !! I just made a batch with my girls ages 4 and 2 and it was a HIT !!! They are having a blast playing with it. There are a lot of laughs and giggles coming from them as they play with it. I found tempera and acrylic glow in the dark paints at the craft store - which one should be used? Thank you in advance for your help. what a great party favor idea. These look great. Thanks for the post. Just made this for birthday party fAvors for a alien space party.. Perfect, easy thank you!! I would like to make this for my sons birthday party. How long does this process take approx. I want to make sure I allow enough time in the "schedule". Thanks!! I would guess to mix it all up would only take about 15 minutes or so. Especially if you have everything ready to go. Have fun, hope the kids love it! Hello im in queensland Australia and i have been looking for borax everywhere and i can't.find it!! I can't wait to make this for my 3 year old :). This is going on the list of Christmas gifts for my nephews! Thank you so much for a great, inexpensive boy gift. I think I am a slime failure. I ended up with a glob of glue like stuff in a bowl full of green water. what went wrong? Sorry it didn't mix up right for you, not sure where it went wrong... There is Science behind this so make sure you're following the exact measurements. Hopefully it will turn out for you next time. Looking forward to trying this with my wonderful neighbor children! No grandchildren yet so I guess I have "adopted" them. They will love it! Excellent for our annual haunted house! Thanks for sharing this idea. Neat! Will make for the kids before our annual camping trip! What else can use by borax? Hi i am planning my daughters birthday party (Teenage Mutant Ninja Turtles) and she would LOVE this!! i want it to be apart of the "goody bag". i found the glo-in the dark paint, and borax. but i have a question. i saw at walmart that they had clear glu AND they also have GREEN GEL glue with a little bit of green glitter mixed in it. Can I use the GREEN GEL glue instead of the clear gel glue? or will that mess up the glow in the dark paint? Substitute Borax and water mixer with liquid starch. Borax is toxic. This is amesome stuff. We are having a Glow in the Dark Pool Party for my son's birthday on Friday, and I made this slime as the take-home party favor (in 4 oz canning jars). I tried increasing the paint from 2 tbsp to 3 tbsp to get a better "glow", but the slime wouldn't stay together....so I kept the paint at 2 tbsp even though it needs to charge for a bit under a lamp to have a slight glow. So the "glow" part of it is not that impressive, but the slime is so cool. Thanks! The kids are going to LOVE it. Has anyone tried to double the ingredients and make extra? Does it turn out okay or is it just better to stick to one batch at a time? Does any of the color come off on your hands and stain them?